We have a fun project for your kids to work on during the Olympic Games that will give them an outlet for their creative energy after they have expended their physical energy trying some of the gymnastic stunts or sprinting feats across your living room floor. My Country Book will help your children record their favorite Olympic moments while reinforcing their geography knowledge and providing an interesting keepsake notebook to enjoy when it is finished. Provide each of your children with a 3 ring binder - ideally one with the plastic overlay for inserting a cover sheet. Open the file below entitled Country Pages. It is a 2-page file. Print one copy of the first page for each child. This is the cover sheet. Have them write their names on it and then decorate as they so choose. You may want to print some photos from the internet that they can use to paste around the border of the page. (Please note: while it is never okay to post or publish photos without permission, using a few for your child's personal and educational notebook is acceptable.) Or perhaps they will want to draw some athletes or sports equipment. Insert the cover sheet into the plastic overlay on the front of his/her binder. Next, print as many copies of the second page as you choose. You can print a few now and more later so that you don't overprint. :) These will be the pages that your child will use to record the great Olympic moments. He will use one page per country. But don't print 196 pages just now as not all countries send athletes to the Olympic Games in London. On each country page, you will notice two blank squares for pasting in a flag and country. These are located within the Country and Flag Flashcards file below. Ideally, you will want to print one full set for each child participating in the project. Finally, print out the Olympic Games world map - one for each child - and place in the front of their binders. This is for reference purposes and will be referred to often. As students begin each new country page, take a moment to look up some information on that nation in Expedition Earth or your encyclopedia. If you do not yet own a copy of Expedition Earth: My Passport to the World, now is a great time to buy one as the book is on sale at a 25% discount between now and the conclusion of the games (scroll down to access sale). Have them find the country on the world map at the beginning of their binder. Now they can dig into their flashcards to locate the appropriate map and country flashcard to paste onto the country page. Have them record the country name and the continent where it is located. Finally the olympic achievements can be recorded on the bottom half of the sheet. Voila! Your kids are learning and having fun too! Enjoy! Let the games begin! 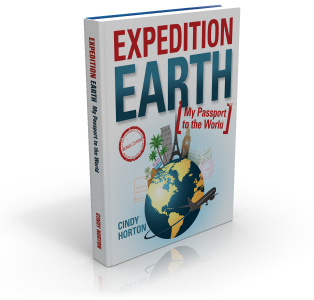 Sale on Expedition Earth: My Passport to the World! *The lesson plans included on the CD-ROM convert this book into a 1 year course in world geography. *Should you decide to use this book and the contents of the CD-ROM with high school students, keep in mind that they may receive a full geography credit for 120 hours of time spent interacting with the material or a 1/2 credit for 60 hrs.